One of Hampshire’s forgotten marks which supplies some surprisingly good action from July right through to February. A fairly shallow venue but a good cast will put you in the depths of the Beaulieu River, especially at low water. It is seldom busy with the exception of weekends during August when a few holiday makers are attracted to the tranquillity of the area and free parking that is available. During the summer expect bass, smoothhound and some very big silver eels along with the odd stingray with an evening session a must. September is always a good month with all the summer species along with a smattering of black bream. Some decent bass nudging double-figures remain active until the end of the year when flounders become the main target by day, but at night pout, rockling and even the occasional codling are taken. Ragworm is the prime bait although the bigger eels and hounds will come to peeler crab. Directly in front of the access point the ground is fairly rough, with tackle losses expected but from 100 yards either side you should not encounter any problems. Use a light beach casting outfit along with a 3oz rolling lead. The whole of the flood and the first two hours of the ebb will produce. Night sessions are recommended for all species with the exception of flounders which are primarily daylight feeders along this section. Branching off the A35 near Totton, follow the A326 all the way down the western side of Southampton Water, passing Hythe on your left. At Holbury the road spits, with the fi rst road leading to Calshot and the other going through Blackfi eld and on to Lepe. Drive west along the seafront and the road will take a right and then a left, and 300 yards further on there is a sharp right at a small junction. There is free roadside parking here, and a footpath leads down to the beach. Bells Sports, 9-10 New Road, Hythe, tel: 02380 842065. Opening times: Monday – Thursday 8am to 5.30pm. Friday 8am to 6.30pm. Saturday 8am to 6pm. Sunday 8am to 1pm. Bait: Live lug and rag and peeler crabs, plus frozen baits. 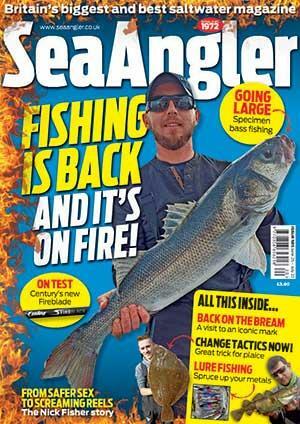 Tight Lines Angling Centre, 1a Rumbridge Street, Totton, Southampton, tel: 02380 863068. Opening times: Every day 7.30am to 5pm. Closed Wednesday and Sunday. Bait: Live lug and rag plus wide selection of frozen baits. Directions : Branching off the A35 near Totton, follow the A326 all the way down the western side of Southampton water passing Hythe on your left. At Holbury the road spits with the first road leading to Calshot and the other going through Blackfield and onto Lepe.